Sturgill Turner Sponsors Junior Achievement "Miss Business"
For more than 60 years, Sturgill, Turner, Barker & Moloney, PLLC has been committed to serving clients in Lexington, across the Commonwealth, and nationwide, with integrity. Whether we’re counseling a family-owned business, a university, or a hospital, we’re focused on delivering exceptional legal advice and results in client-centric and economical manner. “Family” is not the word that typically comes to mind when you describe a law firm, but that’s how we think of ourselves. We care about our employees and put great emphasis on creating a family atmosphere. We work hard, we have fun, and we take care of each other. That’s why we won the Best Places to Work in Kentucky award 13 times. 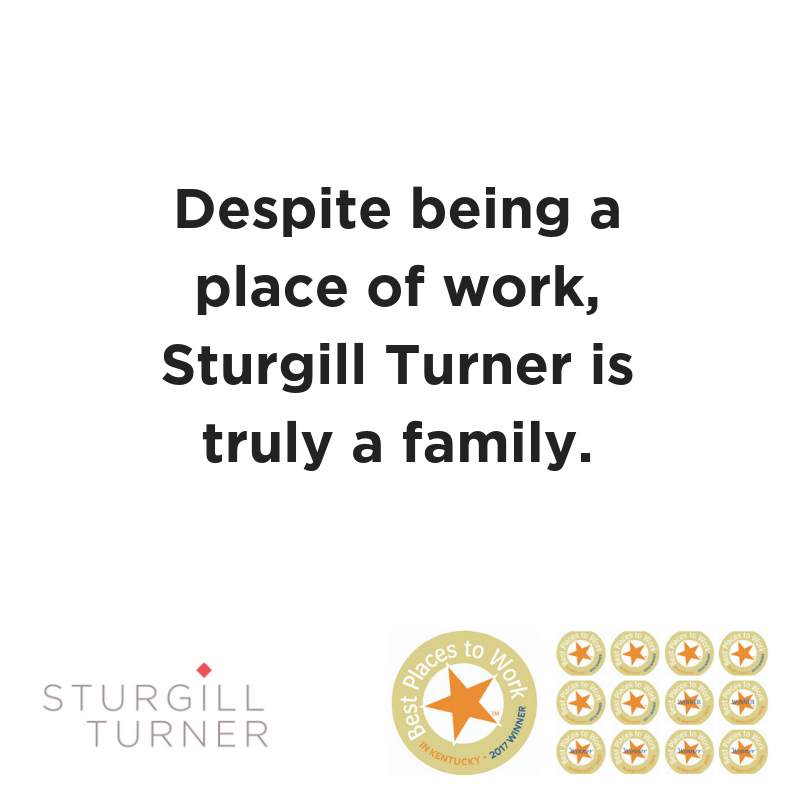 When we hire at Sturgill Turner, we hire intentionally because we hire for the long haul. The average tenure of our attorneys is almost 15 years, and 11 years for our other professionals. We only bring new employees on board who we want to stick around and become an integral member of the firm. We don’t just hire for legal acumen, we hire for fit. Our attorneys are not only bright and hard-working lawyers, they’re also considerate, affable people who serve their clients, their community and each other with integrity. Why should this matter to you? Because we cannot deliver exceptional client service without an exceptional workplace. Our workplace is one where people come to work because they want to, not because they have to. We foster a team environment where our people are willing to go above and beyond for each other and for our clients. We hire people who we want to work with, and we know you’ll like working with them, too. It all began on April 15, 1957, when three classmates from the University of Kentucky College of Law decided that they wanted to open a law practice together, and founded the firm of Sturgill, Moreland & Turner. Don S. Sturgill was a 1955 graduate of the UK College of Law, and a graduate of Harvard, as well. Before the firm was formed, and up until 1961, Don was the Commissioner of Public Safety for Gov. A.B. “Happy” Chandler’s second administration. Don was a thoroughbred breeder and thus possessed a unique knowledge of the thoroughbred industry, which allowed him to become a top equine lawyer. Notable among the accomplishments of his extensive equine law practice include the syndication of a number of well-known stallions, including Triple Crown winners Seattle Slew and Affirmed. He married his wife, Ann, in 1966, who graduated from law school and joined the firm 10 years later. Roy J. Moreland was a 1954 graduate of the UK College of Law, and served in the military, as did the other founding partners, before starting his law practice. Roy was appointed City Prosecutor by the Hon. Richard Moloney (cousin of the present firm’s Moloneys), and later became Trustee in the local Bankruptcy Court. Roy eventually resigned his position as City Prosecutor and became a hearing officer for the Kentucky Department of Transportation. Roy’s father, Roy J. Moreland, was a professor at the UK College of Law and an “of counsel” member of the firm upon its inception. He held degrees from Transylvania University, UK, the University of Chicago and Harvard, and was the longest tenured professor at the College of Law. Gardner L. Turner was also a 1954 graduate of the UK College of Law, and earned a Commerce Degree from the University of Kentucky. Gardner’s early legal practice was truly a family affair—it involved title work, thanks to the help of his father, and Gardner’s mother was the firm’s main typist. The partners would deliver their hand-written letters to her in the morning for her to type on her lunch hour. Mrs. Turner was a great help in getting the firm started and later became bookkeeper on a part-time basis. Gardner became City Prosecutor after Roy resigned from the position, and served as such for 3 years. Afterward, Gardner began to focus his practice on estate work, personal injury matters, collections and commercial corporation work. Gardner was active in the Kentucky Bar Association for several decades and served in many capacities, including a position as chair of the disciplinary section. Gardner practiced law until 2016, acting as the firm’s general counsel, continuing his estate work and mentoring the firm’s new associates. The original law office, built by Charlie Sturgill (Don’s father) and located at 128 East Vine Street, consisted of two rooms: a reception area and an office that included an offset that housed the law library. Partitions were used to create offices for each attorney, but the set-up was problematic, as clients had to walk through Roy’s office to get to Gardner’s office. Later as the firm expanded, Mr. Sturgill built a second story to the original offices, which allowed for each attorney to have a proper office of their own. Since then, the firm has been located in the Merrill Lynch Building and in an office at 155 East Main Street, until it moved to its current office in 2007. Jerry Truitt joined the firm full-time in 1973, and was made a full partner in 1975. The firm name changed to Sturgill, Turner & Truitt in 1977, until it became Ogden, Sturgill & Welch in 1989, and then went back to Sturgill, Turner & Truitt in 1992. After Jerry Truitt resigned to become clerk of the local Bankruptcy Court in 1997, the firm became Sturgill, Turner, Barker & Moloney. Stephen L. Barker joined Sturgill Turner first as a law clerk, then as a full-time associate attorney in 1975. Steve was instrumental in assisting Don in various litigation cases and gained a reputation in the areas of employment and education law, which later attracted numerous corporate clients and memberships in exclusive organizations such as the Employment Law Alliance. The practice of law is a tradition in Steve’s family—he is the son of Hon. George Barker, the former Fayette Circuit Court Judge, and Steve’s son and daughter are lawyers themselves. Donald P. Moloney, II came to the firm from Moloney & Moloney, a firm established by his father and cousin. Pat brought to the firm the focused practice of medical malpractice defense and other litigation defense work, which enabled the firm to expand its defense practice. This field of litigation has become a mainstay of the firm and can be attributed primarily to Pat, and to those who he has encouraged to join to firm to handle this type of litigation. The firm celebrated its 60th anniversary in 2017, and looks forward to celebrating many more milestones as it continues to carry on the traditions and values established by Don Sturgill, Roy Moreland and Gardner Turner when they decided to practice law together back in 1957.